Beehive & Cross Keys maintained their record as the only unbeaten team in the Ziggy’s Metro Cars Halifax Sunday League following their 6-1 Division Two success at Halifax Rangers. It was tight game to call in the first half with both sides having chances until Cross Keys went one up through Karl Smith’s free kick. Not to be outdone Rangers hit back to make it 1-1 at the break. The second half was a completely different story as Cross Keys put the home side to the sword with Matty Hartley scoring on his debut with a magnificent goal from outside the area. Simon Gerrard netted from a corner, Tom Lamb also scored and Karl Smith claimed his hat trick to complete the win. Brown Cow maintained their eight point lead at the top following their 3-1 success at a strong Plummet Line side in a match which was hardly a classic. Cow started the stronger and had a perfect start when captain Gary Binns leapt like a salmon to score from Ash Scully’s corner. The visitors scored a second following a horrendous back pass that went straight to Scott Carney who promptly rounded the keeper and stroked the ball home. Plummet pulled one back with a fantastic strike which Aaron Bergin could do little about. Matt Bodkins added the third following a driving run and a one-two before a cool finish to make it 3-1 at the break. The scoreline remained the same as both times cancelled each other out in a lacklustre second half. The result was the perfect send of for Jack Robinson who couldn’t be there as he was on his way to Catterick to start his new career in the Army. Halifax Hammers Reserves kept their name in the frame for a promotion spot with a 5-3 home success over St Columbas while Old Pond Reserves were 5-2 winners at King Cross Park. Bradshaw lifted themselves into fourth place in Division One following a 5-2 success at bottom side Rastrick Bowling Club. 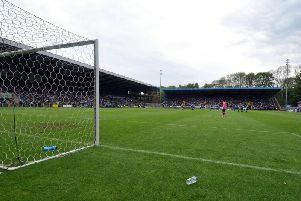 The result was hardly in doubt after Bradshaw opened up a four goal advantage. However, the later stages were marred following an incident that saw three players receive their marching orders. A crunching tackle from a Rastrick player led to Andrew Woodhouse retaliating. However, he squared up to another Rastrick player who became involved and all three were shown red. Bradshaw had opened up a 4-0 lead before Rastrick pulled one back. Another goal before the interval saw Bradshaw cruising, but Rastrick missed a second half penalty before adding their second goal. Chris Woodhouse bagged a brace with Dez Morris and James Thorpe also on target. Triangle’s mini-revial continued with a 5-1 home thumping of inconsistent Queens Head.